Boko Haram has killed 44 soldiers and nine farmers in three days of attacks on some villages in Borno State, AFP has reported. A military officer stated, “Our troops were completely routed and the terrorists captured the base after heavy fighting,” adding that the base commander and three officers were among the dead. According to the report, which quoted security sources, the Islamic State West Africa Province, a Boko Haram splinter group, killed at least 44 soldiers in attacks on three military bases at the weekend. 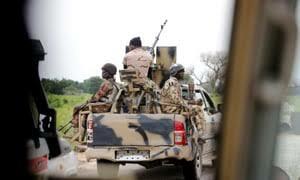 It stated that out of the 44 soldiers, no fewer than 43 were killed on Sunday in Metele, a remote village near the Nigerian border with Niger, according to a military officer, who spoke on condition of anonymity. A pro-government militiaman said the sect members arrived in about 20 trucks, and army air support did not arrive until after they had “invaded the base and looted the weapons”. The same day, the terrorists also carried out a pre-dawn attack on a base in the town of Gajiram, some 80km north of the Borno State capital, Maiduguri. Fighting lasted several hours, local residents told AFP. The report stated that a soldier was killed in an attack on Saturday on a base in Mainok, also in Borno State, the cradle of the Boko Haram movement, security sources said. AFP reported that SWAP accepted responsibility for the attacks in Metele and Mainok, claiming to have killed at least 42 soldiers in addition to carting four tanks and other vehicles away, according to the SITE Intelligence monitoring group. It also reported that on Monday, there were attacks on villages by the sect. The attacks were carried out to pillage food and abduct civilians used as fighters or forced to marry the terrorists. Residents told AFP on Tuesday that armed with guns and machetes, the hoodlums killed nine farmers and abducted 12 others in the Mammanti village in Borno State. A farmer, Usman Kaka, who escaped being killed, told AFP that the gangsters came on bicycles. According to the report, the village chief, Muhammad Mammanti, said the assailants hacked “three people who resisted being abducted”. Also on Monday, seven women were abducted by Boko Haram while working in fields near the city of Bama, according to militiamen fighting alongside soldiers. AFP stated that despite the government’s insistence that Boko Haram was near defeat, the group had recently carried out major attacks on military and civilian targets. However, the Defence Headquarters, Abuja, said the military had issues with organisations focusing on the activities of the sect. The Director, Army Public Relations, Brig Gen Texas Chukwu, could not be reached for comments as his line rang out. The Chief of the Army Staff, Lt Gen Tukur Buratai, last week sent a statement to troops in the North-East, addressing issues of alleged insufficient resources and ammunition. Buratai said, “I remind you of the commitment of President Muhammadu Buhari to provide the resources and an enabling environment in the discharge of our duties.